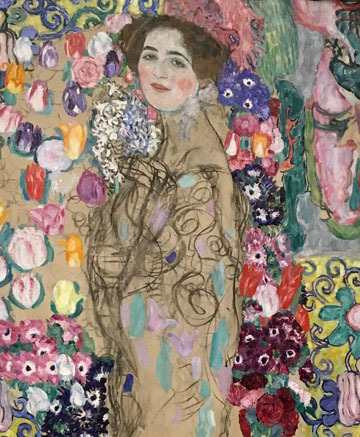 I learned that the woman in this painting and Klimt himself died before he could complete it. I kept returning back to this one, even after walking to the other galleries. There's something about it that made me really inspired. I went home and pulled out some acrylic paints and made my own version of this painting. I'm working on loosening up my technique, so after this stiff painting, I decided to try again and to consciously be more loose with my brush strokes. Though I'm happier with the second painting, it was fun to give it a couple of tries and to take notes.